In Single-step Bayesian Regression does not requiring inverting the relatedness matrix. Also, in single-step Bayesian regression allows us to give different importance to DNA markers used (i.e. variable selection). In the dairy industry, they observe little benefit from Bayesian regression models. But, in the beef industry, we see genomic regions (i.e. QTLs) that have large effects in multiple breeds. Bayesian regression allows us to fit large effects to certain DNA markers used in the genetic prediction. 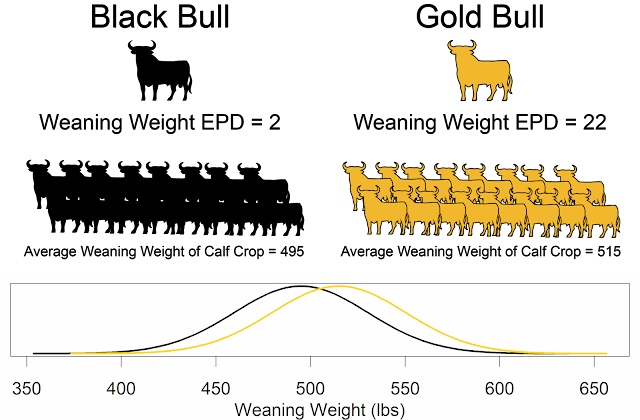 In the single-step Bayesian regression model, we infer (in other words predicting or imputing) the genotypes for all animals in the data set, even those animals that have not been genotyped. Researchers at Iowa State, lead by Rohan Fernando, have created what they call a hybrid model which estimates marker effects for genotyped animals and breeding values for animals without genotypes. 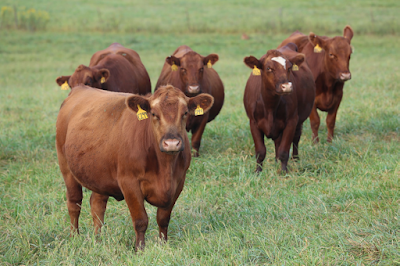 With Simmental data, Bruce Golden see extra improvement in the precision when using a single-step Bayesian regression with different weights for DNA variants. This approach nearly cuts in half the uncertainty of EPDs compared with pedigree estimates. This approach appears to be a major step forward in the precision of EPD estimation.